The Raven Roll and Crossroads trails are located in the Dead Horse Point State Park Mountain Bike Area near Moab, Utah. 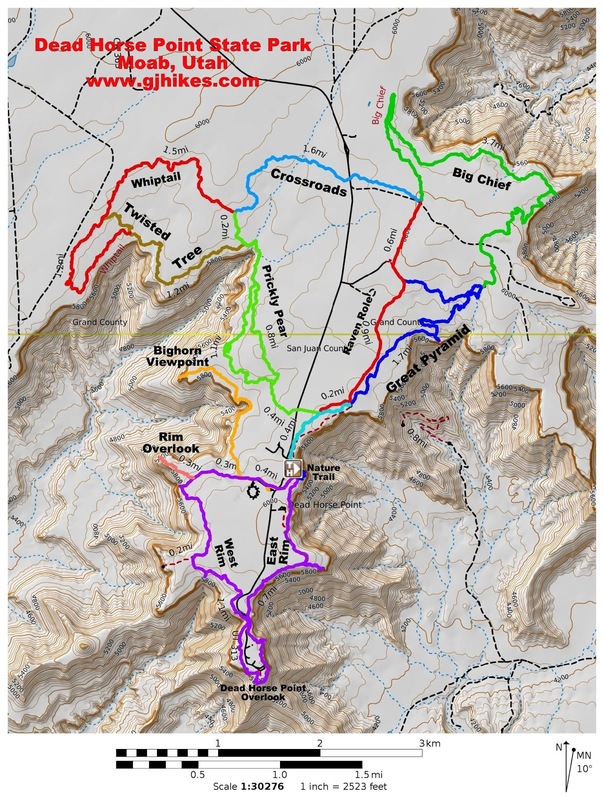 The Raven Roll trail provides a connecting route for the Intrepid (light blue), Great Pyramid (purple) and Big Chief (green) trails. 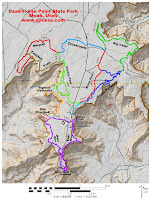 It also connects with the Crossroads trail, which is also colored purple at the top of the map. The Crossroads trail provides a northern route from the Raven Roll trail to the trails in the Shafer Rim area. 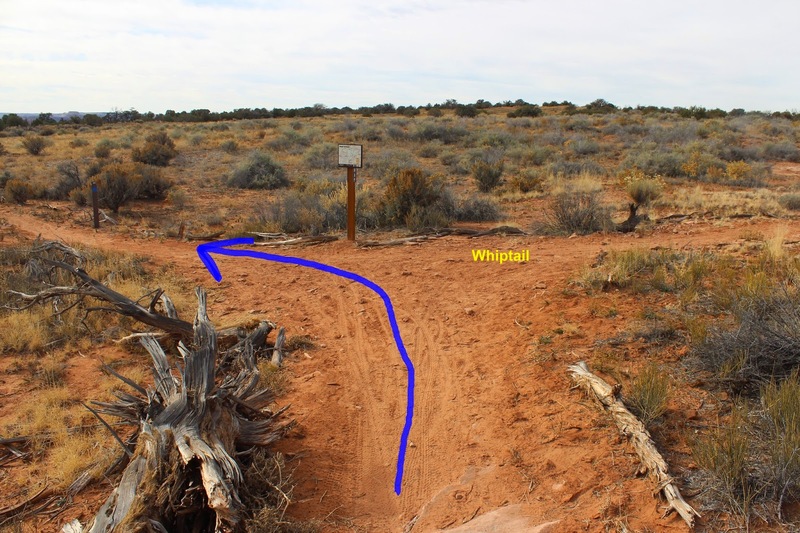 For this post we make use of the east side of the Prickly Pair trail (dark blue) to make a 6 mile loop. The trail begins at the Intrepid trailhead located at the far north end of the parking area at the Visitor Center. After following the Intrepid trail for less than a half mile there is a junction where the Raven Roll trail begins. Raven Roll is easy to follow and easy to ride. The Raven Roll trail has a gradual uphill slope as it heads north. If you were riding it from the other end, or the Group Site, it would be an easy downhill roll for the most part. 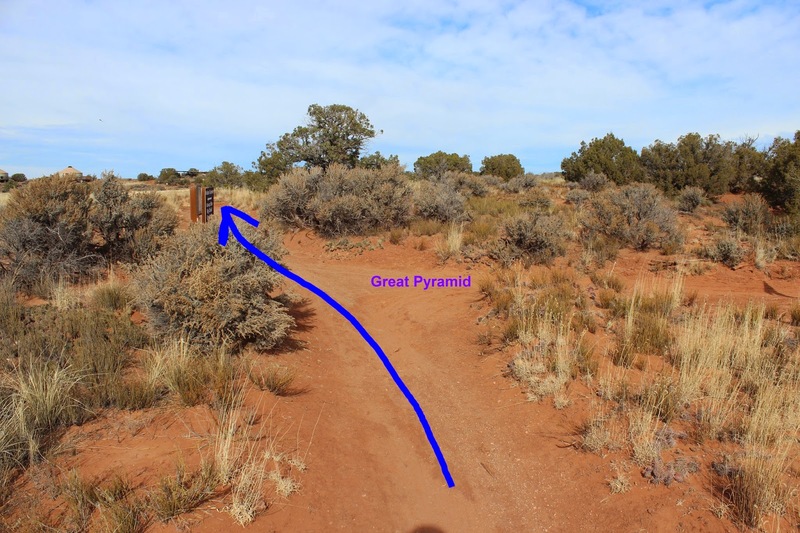 The Great Pyramid trail connects to Raven Roll at about the 1.5 mile point. The next trail junction is at the Group Campground where there is also a restroom. The Utah Parks Service has add a few new yurts that are available to rent at the Group Site. The Raven Roll trail comes to an end at the 2 mile point where the Big Chief trail junctions with it and the Crossroads trail begins. The Crossroads trail is also an easy ride. It begins by heading west across the flats through bunches of grass and desert shrubs. After crossing the highway the trail continues over much of the same type of terrain with a slight uphill slope. As the trail progresses it comes up against the parks northern most boundary. As the Crossroads trail continues it encounters a few areas of slickrock and several shallow washes. The Crossroads trail comes to an end near the 3.7 mile point at its junction with the Whiptail and Prickly Pair trails. The Prickly Pair trail provides the route back to the trailhead for this post. There are many beautiful scenes to take pictures of at Dead Horse Point State Park besides just pictures of the trail. The Raven Roll and Crossroad trails are easy enough for people of all ages. They are a great place for younger riders to hone their mountain bike skills. They are also good connecting trails for the more difficult trails. Using the Prickly Pair trail to complete the loop adds a little to the necessary skill level but if you stick to the east branch of the trail it would probably still be considered to be easy. If you would like to see it for yourself then all you have to do is grab your bike or 'Take a hike'.